Get the essential vitamins, minerals and anti-oxidants your body needs with DEVA Vegan Multivitamin. Balanced, multiple vitamin and mineral formula enriched with special herbs especially formulated for vegans / vegetarians. DEVA Nutrition is pleased to offer this high potency, balanced multiple vitamin and mineral especially formulated for the unique nutritional needs of vegans and vegetarians. This new formula now has more vitamin B-12 because vegetarians and vegans are more likely to be deficient in B-12. It contains no iron for those who seek an iron-free multivitamin. DEVA Vegan Multivitamin is 100% animal free, certified VEGAN by the Vegan Society, and guaranteed for purity, freshness and labeled potency. DEVA Vegan Multivitamin is an exceptional quality multivitamin that combines 1-per-day convenience with its reasonable cost. Each bottle can last up to 3 months making DEVA Vegan Multivitamin very affordable at this special price. 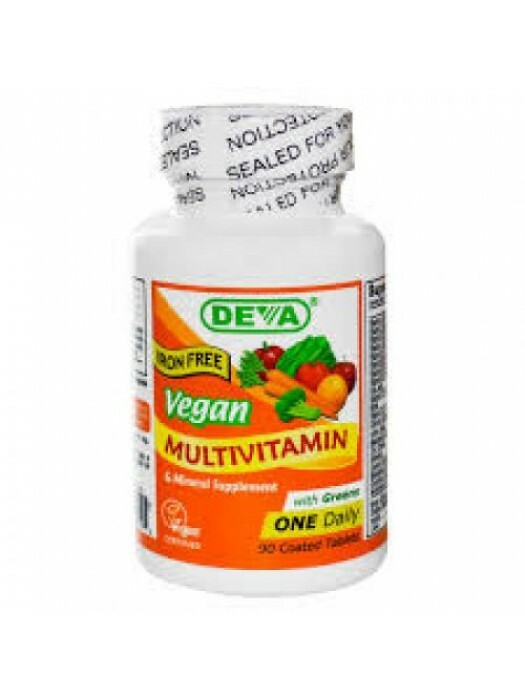 Remember DEVA Multivitamin is 100% vegan, vegetarian and is certified by the Vegan Society, the non-profit organization that actually invented the word "vegan"
For adults, take one (1) tablet daily, preferably with a meal, or as directed by a doctor.